*William Holden was born between 1502 and 1531. He married Anne Houlding between 1543 and 1575. She was born between 1511 and 1534 in Lindsay. She died Jan 16, 1622-23. William died between 1556 and 1616. **William Holden was born about 1523 in Lindsay, Suffolk County, England. He married about 1552 in Lindsay. Her name is unknown, but she was born about 1530 in Lindsay. William died between 1556 and 1614. ****William Holden was born March 26, 1580 in Lindsey, Suffolk County, England. He married Anne unknown, who was born in 1581 in Lindsey, Suffolk County, England. She died in early 1618. William died October 8, 1619 at the age of thirty-nine. To this marriage between 1606 and 1616, five sons were born. Richard Holden was born about 1610 in Lindsey, Suffolk, England. Little is known of his early life, but at approximately the age of twenty-five, he sailed with his brother Justinian to America on April 30, 1634 on the Francis from Ipswich, with John Cutting, master. It is alleged that Justinian and Richard came to America due to religious persecution and had in fact been arrested and detained in England for attending dissenters meetings against the established church of England. They were reportedly released with the understanding that they would not attend such a meeting again. He was noted as a glazier by trade and settled first in Ipswich, MA. He had considerable land holdings in Ipswich and about a year later, he moved to Watertown where his brother Justinian had settled. Richard married Martha Fosdick, daughter of Stephen Fosdick and Anne Harre. Richard and Justinian lived east of Grove Street on Belmont Street in Watertown. On the 10th of the 3rd month of 1642, a highway was ordered between Justinian Holden’s lot to George Parkhurst’s house, which was Grove Street. This order was passed in May and in July Watertown records mention the birth of Richard’s son Stephen. Among Watertown records are three inventories, one of grants and possessions and the other of grants and possessions in 1643. In 1644 – Record of the grants and possessions of he lands in Watertown that were given to Richard were 1. A homestead of five acres bounded the south with the highway and the north with George Parkhurst Jr., the east with John Stebbin and the west with Justinian Holden. 2. Three acres of upland bounded the North with the highway, the south with the meetinghouse land, and the west with Henry Kembell Jr. It appears that Richard moved from Watertown to Woburn “having sold his place to J. Sherman in Watertown, MA 1655.” Records in Woburn list him in 1654, 1657, and 1658 where he is listed as a proprietor of the town of Woburn, MA. He also appears in court in Woburn in 1661. He was admitted a freeman in May 1675 and in the same year reportedly moved to Groton in 1662. According to “The Holden Genealogy” by Eben Putnam, Richard was one of the pioneer settlers of the town of Groton, which was attacked by Indians on March 13, 1675/6, and his home was one of the 46 burned. He then moved again to Watertown where Justinian was living, but by 184 was again in Groton after a short stay in Woburn and Cambridge. Until 1666, he was a member of the militia of Groton and was an original member of the Groton church. Richard returned to live in Groton after the death of his wife on December 6, 1681 in Watertown. Although Richard became a considerable landowner, he acquired no more than what was necessary to support himself and his family. With the destruction of Groton and its property and stock, it probably deprived him of personal property. After the death of his wife, he lived with his son Stephen and all the land was given to Stephen except 33 acres, which went to his sons Samuel. The Holden lands were in the SW of the now present Groton and near the southern limits of the township, extending to the river. He had several hundred acres on the northwesterly part of what is now part of Shirley. Richard died interstate on March 1, 1695/6 in Groton, Middlesex, MA. His grave was probably marked with an uncarved boulder, according to the custom of the day in remote districts, which has long since become overgrown with turf. Richard and Martha had eleven known children. 2. Justinian Holden, born December 23, 1644 in Watertown or Cambridge MA. He married 1st Mary about 1680. She died May 15, 1691 and Justinian married 2nd Susannah Dutton. She was born February 27, 1653/4 in Woburn. They married December 6, 1693. Justinian died 1697-1700. He was about fifty-three. 3. Martha Holden, born January 15, 1645/6 in Watertown, married Thomas Boyden. She died March 18, 1686 in Charlestown, MA. She was forty-one. 4. Mary Holden, born about 1647 in Groton, married Thomas Williams. She died August 1722. She was about seventy-three. 5. John Holden, born March 17, 1649/50 in Woburn, died about 1658 in MA. He was about eight. 6. Samuel Holden, born January 8, 1650/1 in Woburn, married Anna and died about 1739 in Stoneham, MA. 7. John Holden, born about 1656 in Woburn married 1st Abigail. She died May 22, 1685 and he married 2nd Sarah Pierce. She died November 17, 1717 and he married 3rd Abigail Morse. John died October 18, 1756. He was a hundred. 8. Sarah Holden, born about1658 in Woburn, married Gershom Swan and died after 1708. 9. Stephen Holden, born about 1659 in Groton, married Hannah Lawrence. He died November 18, 1715 in Groton. William remarried to Margaret Gale on November 6, 1618 in Groton, Suffolk County, England. She was born about 1583 in Groton and died May 6, 1638 in Groton. Her parents were William and Margaret Gale of Groton. They had one son. William died in 1618 in Groton. Margaret was buried at Groton on December 15, 1638. *****Justinian Holden was baptized October 6, 1611 in Lindsey, Suffolk County, England. He immigrated to Massachusetts with his older brother Richard on the Francis in April 1634. He settled in Watertown, Massachusetts where he was one of the first proprietors. In 1653, he bought some land in Cambridge, the estate of Deacon Nathaniel Sparhawk for 210 pounds. The estate included 294 acres, a dwelling, a barn and other buildings. He was made a freeman in 1657. At age thirty-two, he married Elizabeth Houlding, born in 1601, in 1643 at Cambridge, Middlesex Co., Massachusetts. She was ten years older than him. Elizabeth died in Cambridge on March 18, 1672/3. About June of 1673 in Cambridge, he married Mary Rutter, who was born in 1646 in Sudbury, Massachusetts. Her parents were John and Elizabeth (Plympton) Rutter from Sudburg, Middlesex County. She was twenty-seven and he was sixty-two. They had seven children. He died in August 2, 1691 in Cambridge. Justinian was a carpenter and farmer and gained what was considered above average wealth in those days according to the inventory at the time of his death. Justinian, it would appear spent his life in a more reserved manner and in more civilized surroundings than his brother Richard. The location of his land can be seen on the “Map of the Original Allotments of Land and the Ancient Topography of Watertown,” in the book, “Great Little Watertown by G. Frederick Robinson and Ruth Robinson Wheeler. ******1. Samuel Holden, born April 28, 1674 in Cambridge, Middlesex Co. Massachusetts, married Susanna Shattuck who was born in 1679 in Watertown in 1698. They had one child. He died April 1, 1728. ******2. John Holden, born July 18, 1675 in Cambridge, Mass., married Grace Jennison, born in 1677 in Massachusetts, on November 7, 1699. 3. Isaac Holden, born May 26, 1677 in Cambridge, Mass., married Joanna Shattuck who was born about 1682 on March 8, 1713-14 in Cambridge. He died March 8, 1772 and she died about 1770. 4. Mary Holden, born March 21, 1679 in Cambridge, Mass. 5. Abigail Holden, born about 1680 in Cambridge, married Benjamin Eddy, December 7, 1707 in Oxford Worcester County. She died after 1707. 7. Joseph Holden, born September 6, 1683 in Cambridge, Mass. 8. Elizabeth Holden, born May 6, 1686 in Cambridge, Mass. 9. Ebenezer Holden, born May 11, 1690 in Woburn, Middlesex County, married Elizabeth Reed and died 1756. ******Joseph Holden was born September 6, 1683 in Middlesex Co, Massachusetts. On February 17, 1713 in Watertown, Joseph married Abigail Shattuck who was born about 1692 in Watertown Middlesex County. She was christened July 24, 1698 at Watertown. Her parents were William and Susannah (Randall) Shattuck from Watertown, Massachusetts. He was thirty and she was twenty-one. They lived in Watertown for the next twenty-four years, and their six children were born there. Abigail died in 1728 in Watertown at the age of thirty. *******1. Joseph Holden, born Jan 31, 1716, died September 14, 1774 in Westminster. 2. Stephen Holden, born October 21, 1717, married Abigail Bemis, who was born in 1731 in Cambridge in March 1751. They had six children all born in Westminster, Worcester Co., Mass. *******3. Abigail Holden, born Oct 19, 1719, married David Richardson, who was born April 14, 1700 in Woburn on January 28, 1762 in Newton. Abigail died in 1721 in Watertown, Massachusetts. 4. Abner Holden, born May 6, 1721, died in 1721. On June 11, 1729 in Watertown, Joseph married Elizabeth Russell Dickson, born July 24, 1698 in Cambridge. Her parents were John and Margery (Winship) Dickson of Cambridge. She was thirty-one and he was forty-six. Elizabeth was a widow of Hubbard Russell, who was born in Cambridge. They had four children. In the spring of 1737, the family moved to the newly laid out town of Westminster, becoming the first permanent residents there, the fist family to arrive there having moved away after only a few years. For some time, Joseph was, without a doubt, the most active and influential inhabitant of the town, and was largely responsible for its success and early growth. He was often called upon to represent the town at the state level, and was repeatedly elected to positions of trust in the town government. He was also chosen to be the first Deacon of the church in Westminster, a position he occupied until his death. Elizabeth and Joseph had one child. ******* 7. Elizabeth Holden, born 1730 in Watertown, married John Rand, who was born on October 14, 1722 in Lynn, Essex County, Mass. Elizabeth was christened on April 26, 1730. They had three children. ******** 1. Zacariah Rand, born August 18, 1752. Elizabeth died on December 14, 1756 in Westminster, Massachusetts at the age of thirty-six. Joseph died November 30, 1768 in Westborough, Worcester Co., Massachusetts at the age of eighty-five. His gravestone reads: “Dea. Joseph Holden, deceased Nov. 3, 1768, in the 84th year of his age. He brought his family into this town in ye year 1737 being ye second family; was ye first deacon of ye church gathered hear and faithfully discharged the duty thereof.” Elizabeth lived sixteen years more and died in 1784 in Watertown, Massachusetts at the approximate age of eighty-six. *******Abner Holden was born Nov 2, 1722 in Watertown. His family moved to Westminster when he was fourteen years old. As he grew to manhood with the growing settlement, he became in his time, one of the foremost men of the town. He held many offices, such as selectman, assessor, and town clerk, and was an influence on the public and private life of his generation. He was the magistrate of Westminster, as well as selectman, for nearly two decades. He also took an active role in the relation between the Colonies and England. He was a member of he First Provincial Congress in 1774, a delegate to the Massachusetts State Constitutional Convention in 1779, and the first representative of Westminster to the General Court of Massachusetts. On Feb 25, 1752 he married Elizabeth Darby, born 13 March 1729 in Westminster, Worcester Co. Massachusetts on November 28, 1809. Her parents were Andrew and Elizabeth (Patch) Darby who came from Ipswich, Essex Co., Mass. Abner was thirty and Elizabeth twenty-one. They had nine children, all born in Westminster, Worcester Co. Massachusetts. ********1. Joseph Holden, born 8/2/1753. He married Rebeckah Hoar on 3/18/1779. He passed away 5/31/1797, in Westminster at the age of forty-four. 2. Ruth Holden, born Dec 10, 1754, married John White, born June 1, 1748 in Lexington, Middlesex Co., on April 10, 1766 in Westminster. They had nine children, all born in Westminster. 9. Abigail White, born April 1796. On June 30, 1772 in Westminster, Ruth married Joshua Fletcher, who was born in Grafton, Worcester County. She died October 20, 1804 in Westminster at the age of forty-nine years and ten months. ******** 3. Elizabeth Holden, born January 17, 1757, married Edmond Barnard on November 25, 1773 in Westminster. They had six children all born in Westminster. On January 24, 1811 in Westminster, Elizabeth married Jeremiah Ballard at the age of fifty-four. She died on February 5, 1844 in Westminster at the age of eighty-seven years and one month. ******** 4. Relief Holden, born October 18, 1748, married Thomas Farnsworth on April 29, 1776. She died May 25, 1776 at the age of twenty-eight. ********5. Abner Holden, born June 29, 1760, married Elizabeth Howard on February 9, 1785 in Westminster. He died on Jan. 19, 1824 at the age of sixty-four. ********6. Phebe Holden, born June 30, 1762, married Abel Wood, born December 27, 1755, in Sudbury, Middlesex County on November 21, 1780 in Westminster. They had nine children, all of whom were born in Westminster. ********* 1. Ezra Wood born July 18, 1782. ********8. Abigail Holden, born April 25, 1767, married Nathan Marriam on September 19, 1785 in Westminster. They had five children, all born in Westminster. ********* 1. Joel Merriam born February 21, 1786. 2. Nathan Marriam, born November 27, 1787. 4. Asaph Marriam, born March 20, 1792. 5. Abigail Marriam, born January 27, 1795. On August 16, 1796, at the age of thirty she married Joel Whitney, born September 15, 1765, on August 16, 1796. They had six more children. 6. Cynthia Whitney, born October 12, 1797. 7. Joseph Holden Whitney, born December 27, 1799. 8. Horace Whitney, born April 26, 1802. 10. Theodore Whitney, born April 2, 1807. 11. Relief Farnsworth Whitney, born February 22, 1810. ********* 1. Lucy Holden Whitney, born December 1, 1791 in Westminster. ********Ezra Holden was born December 15, 1764 in Westminster, Worcester County, Massachusetts. He married Susannah Bigelow, born on August 1770 in Westminster, on November 27, 1788 in Westminster. He was twenty-four and she was eighteen. They had six children all born in Westminster. ********* 1. Relief Holden, born March 2, 1789, married Thomas Kendall, born April 13, 1783 in Heath, Franklin County, Mass., on May 16, 1811 in Westminster. They had three children, all born in Westminster. Relief died on September 2, 1875 in New Ipswich, Essex County, Massachusetts at the age of eighty-six. 3. Lucy Holden, born March 14, 1792, married Nathan Wood, born November 18, 1787 in Westminster on May 22, 1811 in Westminster. Nathan died October 17, 1848. 4. Ezra Holden, born October 10, 1793, died October 9, 1801. 6. Susannah Holden, born October 3, 1796, died April 12, 1873 in Lockport. On April 26, 1799 in Westminster, Ezra married Elizabeth Marean Brigham, born August 26, 1770 in Hubbardston, Worcester County. He was thirty-five and she was twenty-nine. They had two children, both born in Westminster. ********* 7. Joseph Holden, born July 16, 1800, married Olivia Daniels, born April 16, 1806 on May 2, 1827 in Keene, Cheshire County, New Hampshire. He was twenty-seven and she was twenty-one. They had one child, born in Keene. ********** 1. Joseph Daniels Holden, born July 23, 1828, married 1st Olive E. Enderton and 2nd Mary J. Howe. Olive died March 14, 1830 and in March 1832 in Keene, Joseph married Susan Brown, born March 13, 1807. He was thirty-two and she was twenty-five. They had eight children, the first six born in Keene, Cheshire County, New Hampshire. 3. Sylvius Hoar Holden, born March 22, 1835, died May 25, 1853. 4. Justinian Justin Holden, born April 7, 1836, married Harriett L. Brown. 7. William Holden, born October 1842, died September 23, 1843. 8. William Hopestill Holden, born May 8, 1844 in Youngstown, Niagara County, New York, married Rachel Turner. September 11, 1872 in Lockport, Niagara County. She was twenty-three. They had three children, born in Lockport. Susan Brown Holden died February 16, 1867. 2. William Henry Holden, born April 17, 1836 in Keeseville and died April 19, 1836. 3. Lucy Marean Holden, born December 15, 1837 in Keeseville, died February 2, 1838. 4. Elizabeth Mattocks Holden, born September 3, 1841 in Keeseville, died May 21, 1842. 5. 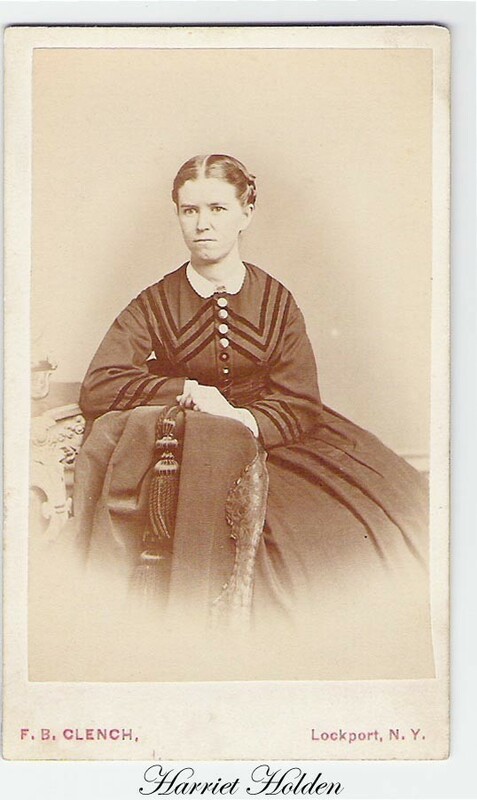 Elizabeth Mattocks Holden, born May 3, 1843 in Keeseville, married Charles Brown Holden, born October 28, 1840. He was the son of Joseph and Susan (Brown) Holden. 7. Charlotte Augusta Holden, born March 27, 1848 in Keeseville, married D.W. Field on June 5, 1877 in Titusville, Crawford, PA.
On November 5, 1809, in Westminster, Ezra married Deborah Bigelow Hoar born on May 2, 1767 in Charlestown, Sullivan County, New Hampshire. She was sister to Susannah Bigelow and daughter of Jabez and Deborah (Knowleton) Bigelow from Charlestown, New Hampshire. He was forty-five and she was a widow of forty-two. They had one son, born in Westminster. ********** 9. Ezra Shattuck Holden, born December 1810. On November 28, 1826 in Chesterfield, Cheshire County, New Hampshire, Ezra died at the age of sixty-two. **********Ezra Shattuck Holden was born December 17, 1810 in Westminster, Worcester County, Massachusetts. He married Elizabeth Davis, born October 28, 1817 in Chesterfield, Cheshire County, New Hampshire, on February 23, 1835 in Youngsville, Sullivan County, New York. Her parents were Jason and Martha (Phillips) Davis. He was twenty-five, and she was eighteen. They had twelve children, of whom the first ten were born in Youngsville, Sullivan County. 4. Ezra Holden, born August 19, 1840. He married Malantha E. Chubbuck and passed away on June 16, 1864 at the age of twenty-four. 7. Martha Phillips Holden, born September 22, 1844, married John C. Griffin, born April 9, 1832, on November 15, 1865 in Porter, Erie County, New York. She was twenty-one and he was thirty-three. They had six children all born in Porter, Erie County. *********** 8. Jason Davis Holden, born June 30, 1846 married Lucinda Davis Cooper. 10. Deborah Bigelow Holden, born November 5, 1849, married George F. Parker, born May 3, 1850, on December 3, 1874 in Porter, Erie County, New York. She was twenty-five and he was twenty-four. (see picture) They had one child. ************ 1. Helen Parker, born May 30, 1876 in Porter. 12. Lucinda Josephine Holden, born March 12, 1855 in Bennington, Wyoming County and died January 7, 1863 in Youngstown, Niagara County. She was eight years old. ***********Harriet Elizabeth Holden was born February 5, 1839 in Youngstown, Sullivan County, New York, married Nathaniel Emmons Davis on December 1, 1869 in New York. She spent her honeymoon in a covered wagon traveling southwest to build a home and life on the plains near Fairbury, Nebraska. Hello,My name is Beverly Barnhart. I have been researching my family, which through a long line leads back to Ezra and Deborah Bigelow Holden. Their son Ezra Shattuck married Elizabeth Davis, who is my 3 greats grandmother. I don't know if you are interested, but I have her birth and death date, as well as Ezra Shattuck's as well as pictures. Are you interested in these to have posted on your site? 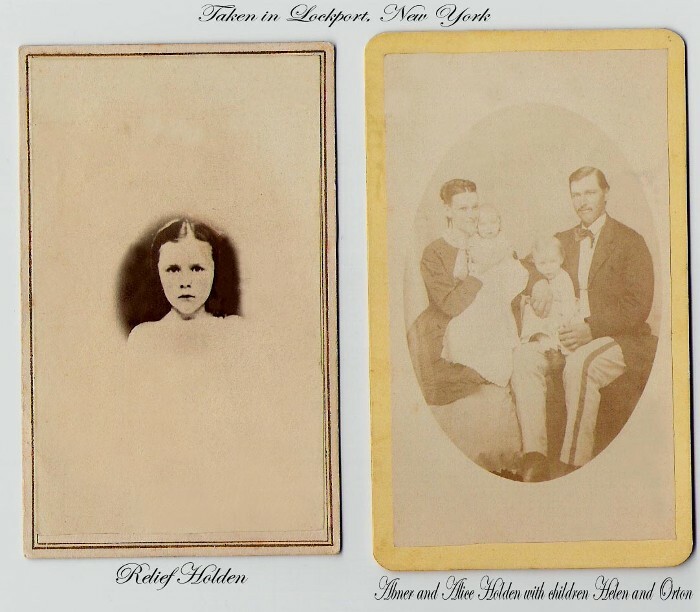 I also have pictures of Elizabeth's parents, Jason and Martha (Phillips) Davis, and Ezra and Elizabeth's children. (They had nine, only four living to adulthood.) I also have pictures that are unidentified, am curious if you know of anyone who might help me. They are somehow associated with the Holdens. 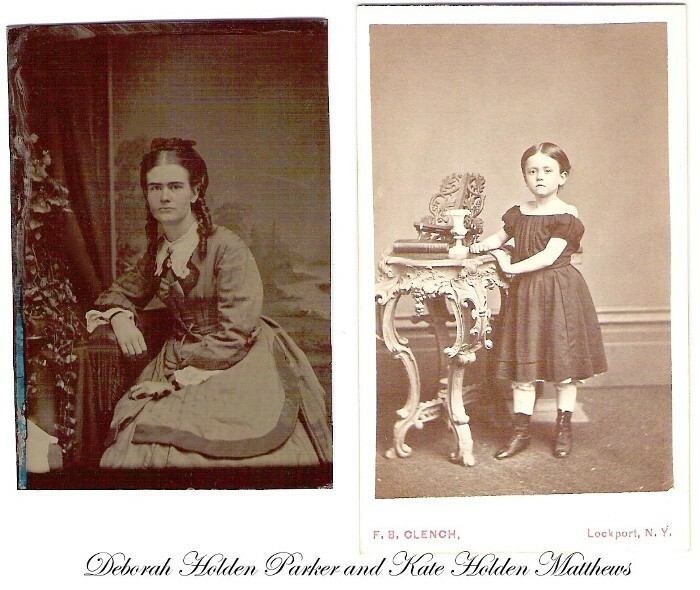 I also have pictures of Joseph and Susan (Brown) Holden, who was Ezra Shattuck's brother.